That all kinds of insects and their offspring feed and live on corpses was noted already in ancient times. "Stay at distance, you, that possess jaws to gnaw!" 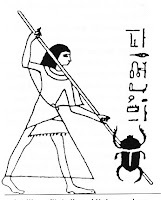 is one of the inscriptions in the Egyptian "Book of the Dead", intended to ban the beetle "Apschait" (Dermestes sp.) to do harm onto the mummies or their grave goods. In other representation scarabs, cockroaches and weevils are symbolically killed by a spear. These insects didn't feed on the mummy, but were dangerous by consuming the food deposited in the grave, needed for a successful journey into the afterlife by the dead. 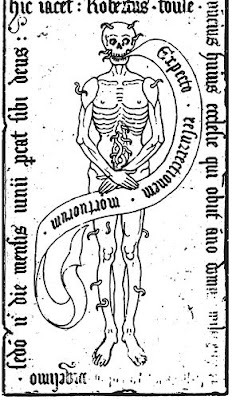 In the middle Ages dead bodies were often represented as skeletons covered with maggots, flies, but also snakes and worms, even if these depictions are probably in part based on true observations of insects colonizing a corpse, the animals had also an allegoric character, representing the sins of the dead. Fig.2. Grave of Robert Touse, who "expects the resurrection of the dead", exact time of making unknown, probably 15th century, figure from BENECKE 2001. Fig.3. "Memento Mori" representing an open grave, Germany ca. 1520. 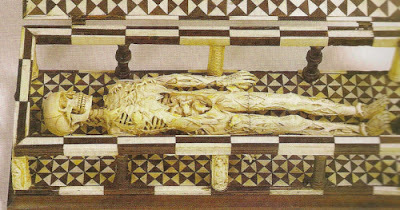 The skeleton shows signs of advanced decomposition, the thin soft parts of the skull are missing, shreds of skin covering the rib cage, the organs of the belly were also decayed - and the body is infested by various animals, snakes, lizards maggots and adult flies - especially the abdominal cavity (figure from WIECZOREK et al. 2009). Only in the 18th, and especially 19th century naturalists and physicians become interested in the process of decay of a body. During exhumations it was noted the presence of different arthropods associated with the bodies, based on these occasionally observations, first tentative death time estimations were undertaken. 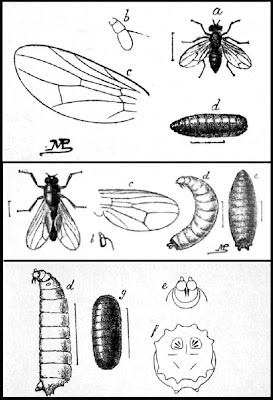 In his work "La Faune Cadavres" (1894) the French physician Jean Pierre Megnin summarized his and others knowledge, and established a time dependant sequence of colonization "waves" by various insects. 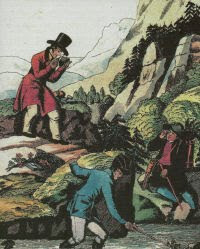 The book also greatly popularized the subject. Fig.4. Figures of flies and beetles from Mégnin´s "La Faune Cadavres" (1894). From these beginnings forensic entomology developed in the last 20 years as a tool of crime investigation, especially useful to determinate the moment of death or the circumstances of burial of a corpse. 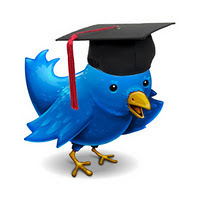 However the application of this method is not limited on recent cases. 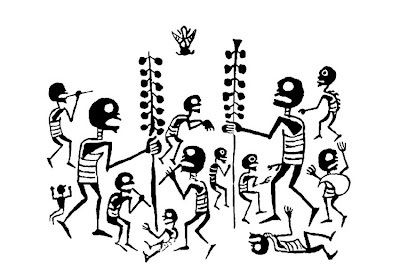 The study of insect remains recovered from sediments of a grave has provided insights in the burial rituals and aspects of the religion of the Mochè, a culture that inhabited the northern coast of Peru between 1900 to 1200 years ago. From depictions on pottery it was possible to infer that the Moche considered the insect-fauna on a corpse as an essential part of the procedure to liberate the soul from the body. Before burial, the corpse was laid out, to enable insects to colonize it, and their maggots to feed on it until it was skeletonised. 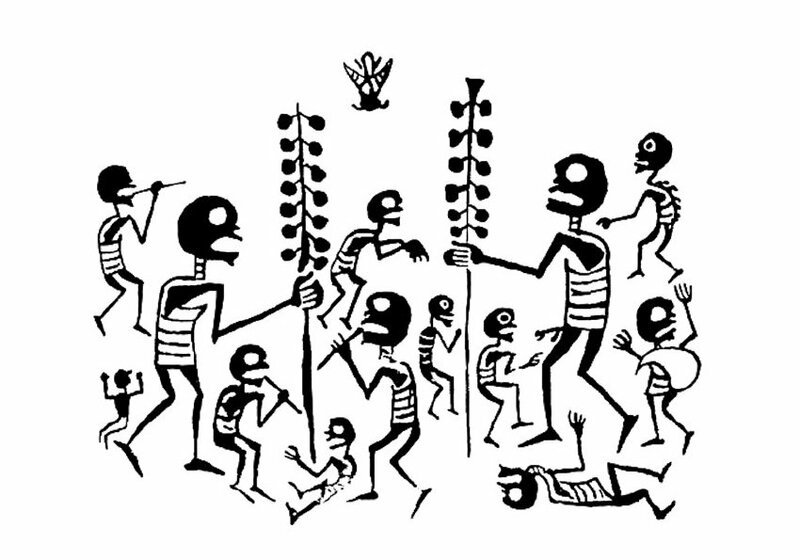 According to the research by archaeologist Jean-Bernard Huchet, of the University of Bordeaux, and the Forensic entomologist Bernard Greenberg, of the University of Illinois, a confirmation of this reconstructed ritual comes from the recovered insect remains from a grave of the "pyramid of the moon", the Huaca de la Luna near the city of Trujillo. Soon after the death of an organism it becomes colonized by a variety of other organism, in part to feed on it, or to use it as nursery for their offspring. In terrestrial environments insects are the most common and copious scavengers, usually different fly species are the first to arrives, in particular the blow flies of the Calliphoridae family and the flesh flies or Sarcophagidae. Most of the maggot pupas found in the grave are attributable to these families. In tropic climate flies of the species Cochliomyia macellaria and then Compsomyiops verena (both species Calliphoridae) are the first to arrive and deposit their eggs. After the arrival of carcasses- specialized species more general fly-species became attracted to the remains, for example the Muscidae species Synthesiomyia nudiseta is attracted to bodies in an advanced stadium of decay. Beetles colonize a corpse only in later phases, when only dry tissue, like ligaments, tendons and fur, remains. Between the recovered materials of the Moche grave also a fragment of the elytra of Omorgus suberosus was found, the larva of this beetle species feed on carrion. According to the species spectrum and the inferred colonization communities Greenberg estimates that the corpses were left on disposition of the insects until three to four weeks after death. Fig.5. Pottery exhibited in the Ethnological museum in Berlin, showing skeletons dancing in front of a fly (HUTCHET & GREENBERG 2010). Fig.6. Pottery exhibited in the museum of Colchagua (Chile) showing captured warriors lead to the awaiting flies (HUTCHET & GREENBERG 2010). I suspect the relationship may not have just been allegorical but based on faulty observation in the middle ages. Maggots, Flies,snakes and worms were all thought to be the result of spontaneous generation. Saints bodies were of course not subject to such corruption. It may be an example of minds alleged effect on the body and soul. 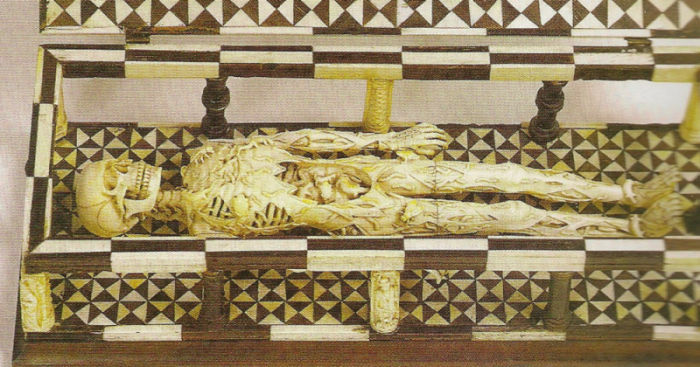 The thought that a snake formed out of youre spine after death may not have been something the average 'sinner' of the middle ages looked forward to happening to his corrupted and earthly body after death. Thank´s - thats a legitime an intriguing observation – I added a „Memento Mori“ where the connection to insects (flies) is more evident,at least there was an observation on real models for the artwork, even if the interpretation then was not correct.